The deafening crescendo of the Information Age continues to reverberate for businesses globally. We’re seeing self-driving cars, cryptocurrencies, remote working, start-up unicorns, conversational artificial intelligence, and a new essential – digital transformation. There will always be arguments about whether technological initiatives are essential to every business today; yet, with the advent of automated digital metrics, proof of performance has never been more easily demonstrated. Not only do metrics keep us transparent to our stakeholders, they are also useful as a measure of how our business choices impact on our bottom line. New tsunamis of change are once again bringing about a paradigm shift in how we do business. Smart leaders know they must derive new metrics to meet and measure their ability to perform. Let’s look at the most recent turbulence – gender. Women will control 75% discretionary spend worldwide by 2028, Ernst & Young reports. Consider how your business is strategising to leverage this phenomenon. Current metrics are too quantitative, rigidly constrained and relatively superficial. Many businesses only report on only one or two measures of gender performance – the ratio of male to female staff, and their ability to level the gender pay gap. That certainly isn’t enough to forecast gender’s effect against performance and profitability; and the lack of more meaningful metrics blocks our ability to see how gender can have an impact on many other parts of the business. Often, businesses will confuse leveraging gender differences with the implementation of equal opportunity policies. Gender segmentation in your market research is not discriminatory; it is essential. In fact, it’s clever to dive even further into the different and evolving needs of your changing customer base. A further step is to use this as a guide for your budgets too. If you’re a brand who has 60% female customers; ensure that you devote 60% of your budget towards appealing to those female buyers. The final number provides a basis for deciding whether a female-focused strategy is worth the capital and the pursuit. There are plenty of specially curated tools out there to help diagnose gender performance such as WGEA’s readiness assessment or WEPs’ Gender Gap Analysis Tool. Like our online diagnostic Cardiology, they are useful starter tools to help uncover initial issues that need to be tackled before any strategy or action can be taken. Cardiology is helpful particularly in highlighting how current staff see your business, and in encouraging their buy-in. 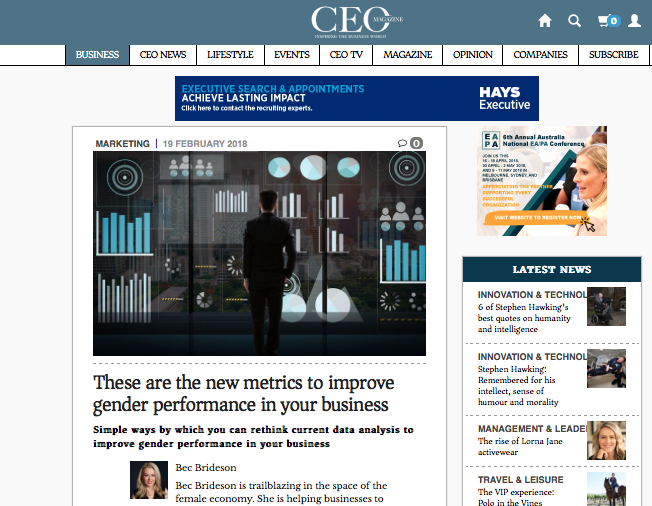 Businesses often miss what we call Key Gender Indicators – the signposts within your business that qualitatively gauge gender performance. While this dives further into your internal m:f ratio; it also includes a salient look into your m:f customer ratio, buyer behaviour and customer mapping, HR policy and innovation attitudes, plus audits of internal and external communications. KGIs will enable you to see the bigger picture when it comes to gender’s impact across the whole of your business.